ALL GONE! Colonial Knife Co. Knife Rights 2018 Limited Edition CE-100 Nemesis Bushcraft Knife: $200 Retail Value Without Engraving - FREE* to $400 Donors - ALL GONE! This Knife Rights 2018 Limited Edition Colonial CE-100 Nemesis Bushcraft Knife is laser engraved with the Knife Rights Sharper Future logo. It is a $200 retail value without the engraving! ALL GONE! 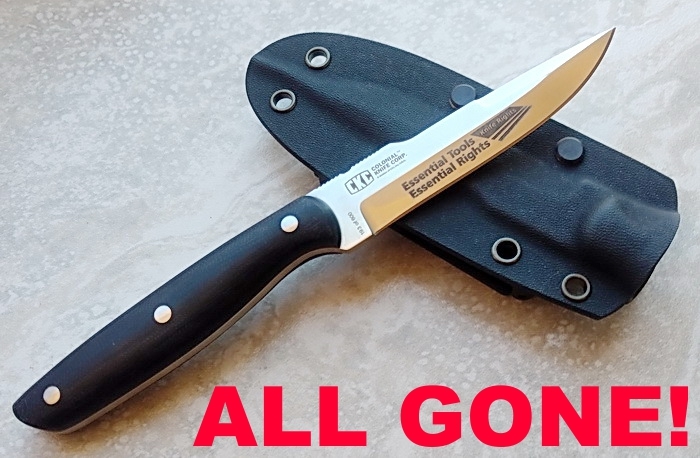 Generously donated by Colonial Knife Corp. - Retail Value without engraving: $200 - FREE* to $400 donors - ALL GONE! This CE-100 Nemesis Bushcraft knife, designed slim and sleek, is a narrow blade that stows easily among the loads of gear that the military, forest service, and outdoor guides have to carry. It sports a sharp edge and a aggressive point. Great for odd jobs, quick cuts is is the foe of anything that stands in your way. A lively utility blade with a tactical profile that makes it almost disappear on your side but stays handy for when you need it. Trim handle design makes the blade nimble to control, yet there are plenty of open contours that make it easy to use with gloves on. Comes with a molded Kydex belt sheath. When the Paolantonio brothers founded Colonial Knife and created its first pocket knife in 1926, the three knew it was destined to become an industry standard. Today, Colonial is proud to manufacture the highest quality in precision cutlery–quality that can only come from nearly a century of knife making experience. That’s why Colonial is able to offer a lifetime warranty on all its products. Today, Colonial continues to push the industry to its manufacturing boundaries. Through the use of innovative technologies and breakthrough metal research, Colonial Knife thrives in the outdoor products industry; a feat which requires a powerful position along with creative thinking. It’s the perfect confluence of art and science-the kind of performance you’ll find at Colonial, and the type of ”pushing the envelope“ that has made Colonial an industry leader.